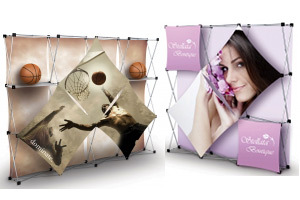 Exhibition Display Stands, Walls & Panels - Combine To Create Your Perfect Exhibit! 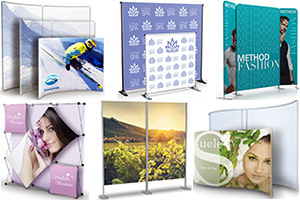 Trade show exhibit display walls and panels are often utilized in various configurations by combining a few smaller graphic floor display stands together with larger exhibition display panels to form larger display walls with different shapes and styles. You can create all types of exhibit booth designs such as L shaped exhibition stands, U shaped exhibits, and various other types of configurations. 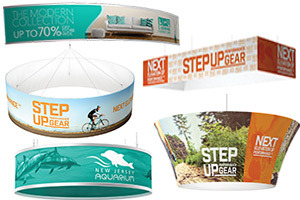 The benefits of being able to add and remove exhibition display stands for different trade show events is profound. By making larger exhibit display systems out of smaller individual floor standing exhibit panels, it reduces stress by making it more compact and easy to transport. 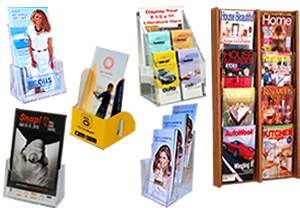 Another added benefit is that you can create different graphics and advertising messages for each exhibit display panel. These pop up exhibition displays are so unique and eye-catching people can't help but notice them. 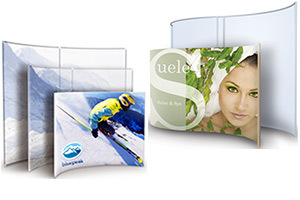 These exhibit displays feature multiple panel backdrops that enable you to display and promote different products or brands on each graphic panel. 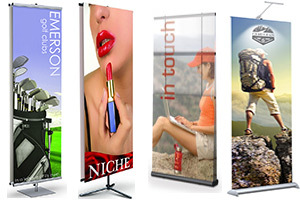 A different graphic promotion can be designed for each panel. Quick and easy to assemble. Just pop-up and assemble in minutes. Graphics can stay attached to frame when closed making setup and take down a breeze.